'Oh no, Monster Tomato!' 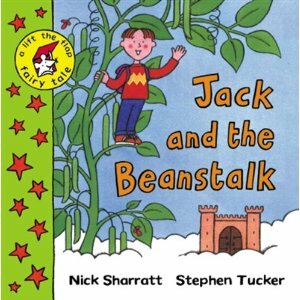 by Jim Helmore & ﻿Karen Wall, is a tale about a little boy called Marvin, whose brother & sister tease him about his height. They enter a tomato growing competition & tell Marvin his tomato will be tiny too! With a little bit of magic & a special song Marvin's tomato grows, & grows, it even grows off the page! A fun book, & useful book for exploring sibling rivalry too! 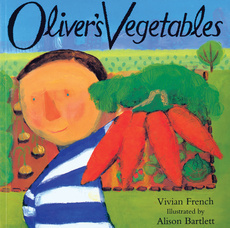 'Oliver's Vegetables' by Vivian French is a wonderful tale about a boy who only eats chips! That is until he plays a game with his Grandpa, & whatever vegetable Oliver finds in the garden he must eat. Oliver finds carrots on Monday, spinach on Tuesday, rhubarb on Wednesday, etc. Great for introducing planting, different vegetables, & days of the week. Could be useful for fussy eaters too. 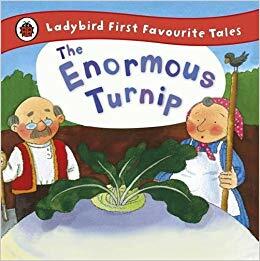 This version of the classic fairytale 'The Enormous Turnip' has a great rhyming text, & fun illustrations. The repetition in the text, as everyone joins the farmer to pull the turnip, is perfect for encouraging participation. Here's hoping our turnips don't get quite as large as this! Looking forward to reading our healthy 5-a-day, & sampling some homegrown goodies too!